Mary Fairchild went to Paris in 1885 to study painting and was accepted the following year at the Salon where she exhibited regularly afterward. She married the sculptor Frederick MacMonnies in 1888 and eventually set up house in Giverny not far from Claude Monet and a growing number of American expatriates. The couple divorced in 1908 and the following year Mary MacMonnies married Will Low, who became quite enamored of her while visiting one summer. The newlyweds moved with Mary’s two daughters to Will’s home at 25 Prescott in 1910 and became an integral part of the community. 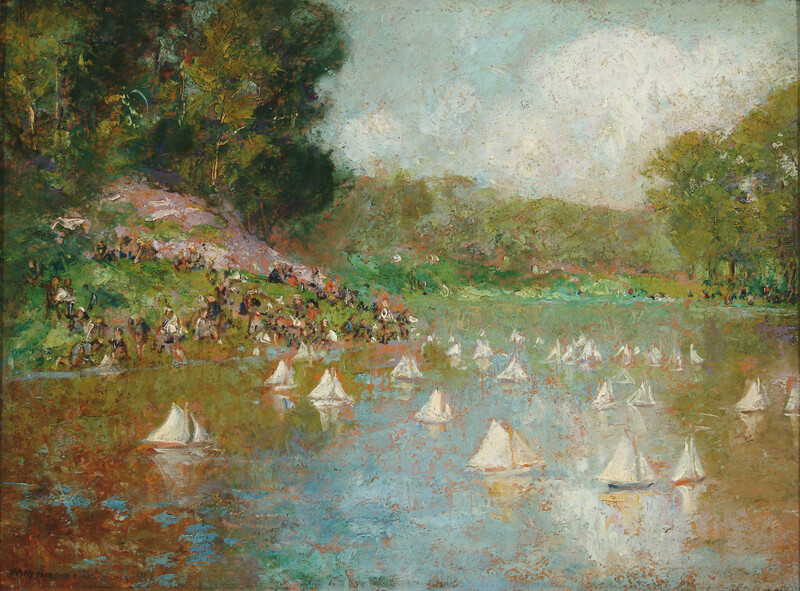 Children’s Regatta at Bronxville Lake is a charming depiction of this annual event, and the painting was given as a wedding gift to Fanny Ellsworth and Robert Scannell, a local architect. Low’s mastery of the Impressionist technique, adopted while living in Giverny, is clearly evident in this work, and evokes a nostalgic window to Bronxville’s past.